Thank you very much, Congresswoman Shelley Moore Capito, and Congressman Jim McDermott, for organizing this wonderful reception. Thank you very much everyone for coming here. I am very honored to be here. First of all, I would like to express my deep appreciation for your support during the difficult times after the Great East Japan Earthquake. We sincerely appreciate the warm support from the United States. Today, I would like to talk about two things, atomic energy and military base problem in Okinawa. This time, I came to Washington DC because I was selected as one of the Foreign Policy’s Global Thinker 100 for 2011. It is indeed a great honor. The award was given for my 30 years activities to abolish nuclear plants. Japan currently has 54 nuclear reactors, and 11 are in operation. The accident at the Fukushima Daiichi nuclear power plant was a serious level 7 accident that resulted in radioactive material being widely dispersed. The recent Fukushima nuclear accident was extremely serious, but even more severe accidents could occur. In earthquake-prone Japan, it is essential that we denuclearize. There is a risk that not only Japan, but the entire world could be affected. Since nuclear reactors are not able to process radioactive waste, this waste must be disposed of in some way. And finally, the export of nuclear reactors is ethically unacceptable. Japan has experienced major incidents, and we are acutely aware of the fact that nuclear plants and people cannot co-exist. We at the Social Democratic Party, along with many citizens, have worked for denuclearization, but we were not able to prevent the accident on March 11. Going forward, I will continue to give my all to achieve denuclearization throughout Japan, and to realize a world free of nuclear weapons and nuclear power. I would also like to talk about Okinawa base problem. Especially as I really appreciate Japan-U.S. friendship, I believe that we need to solve this base issue for better and permanent friendship. The land of Okinawa makes up for only about 0.6 % of the whole of Japan. The tiny islands have more than 30 U.S. military bases and facilities, which is 75% of all U.S. military bases in Japan. We are working to change this. In May, last year, a joint Japan-U.S. statement was issued saying that a new U.S. military base will be built in Henoko, a place surrounded by beautiful seas which are the habitat for Dugong, endangered manatee-like mammal and corals. I opposed to this agreement, and as cabinet member, refused to sign the cabinet decision on the measures to be taken. I was consequently dismissed from my post as Minister. I am determined to do everything I can to change the government’s policy on Okinawa. 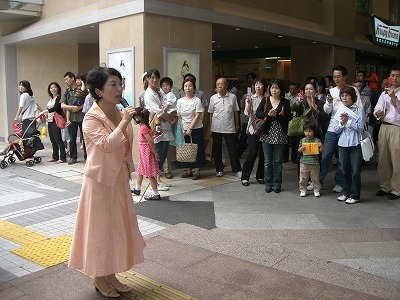 Okinawan people oppose the plan. All political parties in Okinawa, including the LDP, oppose the construction. Okinawa prefectural assembly unanimously adopted resolution to oppose the new base. This strong Okinawan voice will never change. I respect the United States. The United States is the country of democracy. If the two governments force the construction, the new base will be surrounded by the hatred. It will bring much damage on the Japan-U.S. friendship. In addition, two countries have been suffering from the financial difficulty. Why don’t we change the military policy into a cost-effective one? The reduction of U.S. military bases overseas will be a good first step for the solution of the U.S. financial problem. From a practical view, I strongly hope the Japanese and United States government will change the agreement. When I see the situation around nuclear plants and U.S. military bases in Okinawa, I believe, Japan and the United States can find a win-win situation. I think now is the time to change the policy, to the perspective of environment-friendly, life-friendly and cost-friendly. We need courage and leadership to change the existing policy. I hope we can work together with U.S. congress members. And I believe that Japan and the United States can continue having the good friendships forever. Thank you again for coming here today, and giving me a great opportunity to meet you. Thank you.